Beloved of early civilizations, Lapis was used extensively in ancient Egypt and Sumaria for jewellery, amulets, and inlay on sacred objects. Its intense blue colour made it highly desirable, and indeed gave it is name - derived from arabic, to mean "sky stone". Its use continued through the Romans and in later civilizations it became popular, ground, as a pigment for painting. So bright is its hue that, in many cases , its use on canvas and fresco has endured over decades, to this day. Perhaps some of its alleged amuletic properties have filtered through to modern day practitioners who use crystals for healing, who suggest it for stress relief, clarity and objectivity, self knowledge, to aid insomnia and disperse migraine. 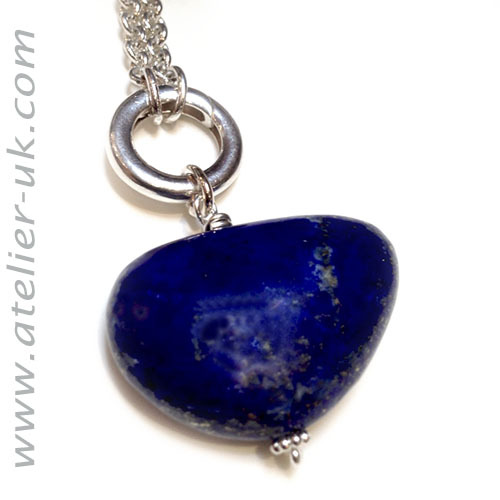 Fabulous blue lapis lazuli with pyrite flecks make up these abstract pebble shaped drops to add to your Rosa necklace. These nuggets are natural in colour, with no dye enhancement and are from Afganistan, the home of high quality lapis. Each nugget varies in shape, but slices measure approx 15mm x 25mm.